Have you been rejected as a LASIK candidate due to thin corneas? This is one of the many cases for patients. After being turned away from LASIK surgery, many people believe they’ll never be free of contacts or glasses, but there is a better alternative to LASIK if you have thin corneas. The cornea is the transparent eye tissue that is located on the outermost layer of your eye. It functions to protect your eyes from dirt and germs along with filtering out small sounds of UV light. They can lead to a variety of vision symptoms that can have short term and long term effects. Additionally, it may disqualify you from being able to go through with certain eye surgeries. If I Have Thin Corneas, Do I Qualify for LASIK? The cornea is altered when LASIK is performed since it is responsible for how light enters your eye, influencing one’s scope of vision. During a LASIK procedure, the surgeon cuts a flap into the cornea, unhinges it and then uses a laser to cut away tissue to reshape it. The more nearsighted you are, the more tissue the doctor has to remove. After this procedure is completed, the flap is replaced and given time to heal. 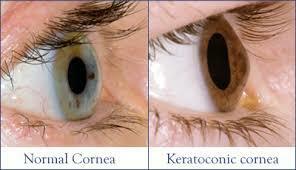 With some patients, however, the corneas are not thick enough to withstand cutting. Cutting into these patients’ corneas could lead to a substantially weakened eye, something no one wants. Other problems can develop, as well, including ectasia, where the cornea becomes so weak it begins to bulge outward and can even lead to permanent blindness. A notable condition of corneal ectasia is keratoconus, where the cornea bulges outward, which can lead to worsening one’s vision. People also consider alternative procedures such as LASEK, Epi-Lasik and PRK, but each of these involves removing tissue from the eye using a laser or blade. LASEK: With the similar-sounding LASEK procedure, eye drops loosen the cells on top of the cornea, the cells are scraped to the side, a laser is applied to reshape the cornea, cells are smoothed back on and a contact lens is placed on top to help the healing. Final results from the surgery usually take one to two weeks to fully heal and patients are usually required to wear a “bandage contact lens” for three to four days after the procedure. PRK: During the PRK procedure, the outermost layer of the cornea is scraped, then reshaped. With PRK, no flap is created. Vision typically becomes completely clear and stable after one to three weeks or up to three to six months after surgery. The Visian ICL: Possibly one of the strongest choices for people with thin corneas is Visian Implantable Collamer Lenses, a procedure that uses a biocompatible, advanced lens rather than cutting away eye tissue. As a bonus, the lens provides UV protection and does not promote dry eye syndrome. If needed, the lens can be removed. Results can usually be seen within the next few days after the 20 - 30 minute procedure. Just because you have thin corneas, it doesn’t mean you’re out of luck. If you’ve been rejected as a candidate for LASIK or are looking for a premium alternative, contact a qualified Visian ICL surgeon today to learn about your options. An Evolution in Visual Freedom. Meet the Visian ICL!